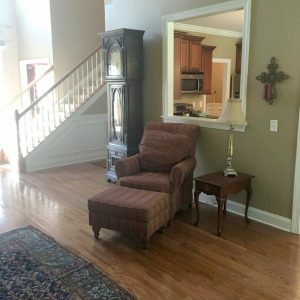 Before and After pictures of a Murfreesboro, Tn home staged for clients after rehabbing it and getting it ready to place on the market for sale. We de-cluttered, re-positioned, organized and staged this entire home on Marathon Drive, Murfreesboro, Tn in 2 days. The owners purchased the home to rehab and flip. They engaged me to help them get everything organized and staged to present the home in the best possible light. The empty rooms where staged with furniture that complimented the home so potential buyers could better visualize each space. We also brought in some additional furniture, artwork, and accessories to finish it out and give it a lived in feel.